21 So Gehazi hurried after Naaman. 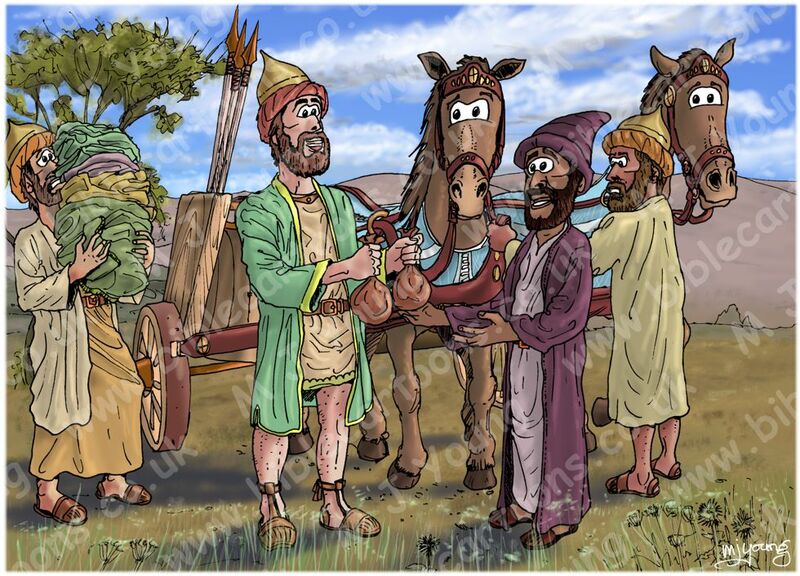 When Naaman saw him running towards him, he got down from the chariot to meet him. “Is everything all right?” he asked. The exact time of day is not mentioned in the Bible account. If Naamam’s encounter with Elisha, and his journey to the River Jordan, washing, healing, return to Elisha, conversation and departure, all occurred on the same day, then I image quite a lot of time would have elapsed since dawn. The narrative also tells us that Gehazi ran to meet up with the Aramean after he (Naaman) had travelled “some distance”, all of which adds some time to the events. I therefore image it might be mid to late afternoon when this scene takes place. The afternoon sun illuminates this scene, from right to left. From left to right: a servant of naaman’s, carrying two sets of clothes. 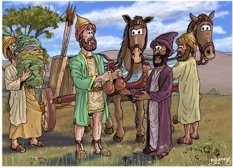 Naaman, the Syrian army commander, Gahazi (Elisha’s servant), a soldier/charioteer holding the two horses that pull Naaman’s chariot. I have drawn both Gahazi and Naaman I previous scenes, so used the skin, hair, and clothing colours I established in those scenes, in this one, to maintain continuity between stories/scenes. I used some reference photographs for the design of the Aramean chariot Naaman was riding in. I also found some photo reference of the landscape around Samaria to help me create the background scenery. Apparently Elisha settled in Samaria after spending some time before on Mount Carmel. How much would 2 talents of silver weigh, in pounds and kilograms? 1 talent of silver = 75 pounds ( about 34 kilograms), so 2 talents of silver = 150 pounds (about 68 kilograms). As a comparison, the average man in UK weighs 182.84 lb (83.6kg), so 2 talents of silver = 0.82 of the weight of a man! Based on that calculation there is no way that Naaman can be carrying 2 talents of silver in the 2 bags he is handing over to Gehazi, more likely he has lots of bags to make up that amount of weight!